Enhance your product with Support.com® Support.com Cloud. Integrate with our API today! Support.com Cloud SDK for iOS enables you to deliver Self Service & Assisted Support to your customers, from within your application. It allows support to be provided in the context of the user’s interaction with your application, thereby increasing the efficiency of support interaction. Ability to engage the customers instantly through Chat. Capability to collect device vitals & perform remote diagnostics like configuring Wi-Fi/Email etc. Allows your agents to view the screen of your application running on the connected mobile device. Enables Live Camera streaming (a.k.a SupportCam™) during a session. Allows both Agent and Customer to access and view the same web page highlighting different elements on the page. Allows your Customers to perform Self Service actions. This guide is intended to assist software developers who want to embed Support.com Cloud SDK into their iOS Applications. 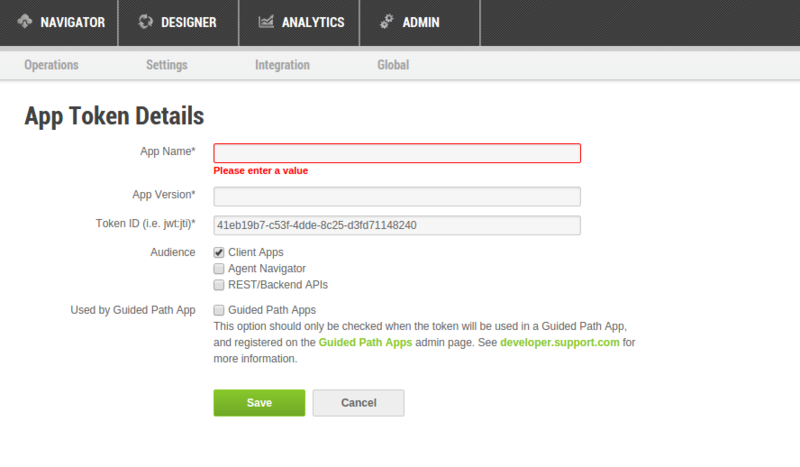 A Guided Path is a set of instructions (/steps) that an agent &/or consumer can follow to fix a technical support issue. Support.com Cloud allows you to create both agent and consumer facing guided paths. Support.com Cloud allows you to associate help-ids and tags with your guided paths. A help-id is an alias for your guided path. There is a one-to-one mapping between a guided path and a help-id. However, you can remove an existing help-id from one Guided Path and add it to another Guided Path. For instance, continuing with the previous IoT example, lets assume that the first screen on your app is the on-boarding screen. If the consumer clicks on help on this screen, you could use the Support.com Cloud SDK to open the 4th Guided Path. Tags allow you to configure a family of related guided paths. As an example, assume you associated a tag of LightBulb with both GP 1 & 2. You can then configure the Help button on your LightBulb screen to show guided path 1 & 2. Self Help screens shown by Support.com Cloud SDK, will also allow your user to reach out to your agents via a single click on Live Help. If/when your consumer transitions from Self Help to Assisted Support, your agent will be able to view all of this context as well as all consumer actions on the guided paths. If you logged the consumer information, then Support.com Cloud will even create a consumer record in the system. 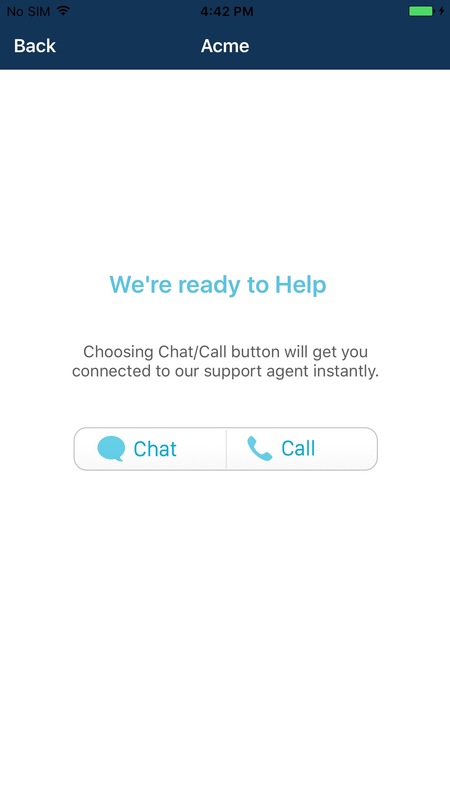 As mentioned before, Self Help screens shown by Support.com Cloud SDK, will also allow your user to reach out to your agents via a single click on Live Help. However, Support.com Cloud SDK also allows you to directly take your consumer to Live Help. When the session transitions to live help, your agent will be able to use all the tools such as chat, co-browse, support cam from within your application. Xcode 7.3.1: If you don’t have it, you can get it from the App Store. 1. Download Support.com Basic Cloud SDK for iOS. Basic version of SDK includes all the above listed features except Live-Camera streaming (SeeSupport) functionality. CoreSupportcomCloudSDK.framework: Core library that enables your application to integrate to Support.com Cloud. It also includes the primary header file: SupportcomCloudSDK.h. You will be using it to call SDK APIs. SupportcomCloudResources.bundle: Resource bundle containing default resources used for Support.com Cloud SDK screen branding. It includes SupportcomCloudBranding.plist file that lists all configurable branding entities. 2. Download Support.com Full Cloud SDK for iOS. Includes all the above listed features with Live Camera streaming functionality. SupportcomCloudSDK.framework: Core library that enables your application to integrate to Support.com Cloud. It also includes the primary header file: SupportcomCloudSDK.h. You will be using it to call SDK APIs. Both the SDKs are bitcode enabled. You can use either Automated Integration or Manual Integration to integrate Support.com Cloud SDK with your application. To start using Support.com Cloud SDK in your project, add the following line to your Podfile according to the version which you wish to integrate. Then run pod install or pod update to refresh your cocoapods dependencies. You can now move on to SDK integration. Launch Xcode. Open your iOS app project. Drag the unzipped files, SupportcomCloudSDK.bundle & CoreSupportcomCloudSDK.framework or SupportcomCloudSDK.framework, into your Xcode project in project navigator. In the import dialog, check the box for Destination: Copy items if needed. Switch to the Project > Build Settings tab and find the Other Linker Flags under “Linking” section in the build setting. Add two flags: -ObjC and -lc++. To setup the dependencies, switch to Build Phases. Expand Link Binary with Libraries section and add the following frameworks. Click on “Add Other” in the “Choose frameworks and libraries to add” dialog. Browse to the added SupportcomCloudSDK Frameworks folder (SupportcomCloudSDK.framework/Frameworks). You are now all set to integrate and use the Support.com Cloud SDK. To use the Support.com Cloud SDK, you need to create and register your application token with Support.com Cloud. 1.Log into your Support.com Cloud account. 2.Goto Admin > App tokens. 4.Fill in details of your application: Name, Version, Unique Token ID. 5.Select iOS from the Platform drop-down. 6.Select Client Apps only in Audience. 8.Click on View JWT button. 9.Copy the token. To use the SDK, you will be required to send this token as a parameter to the API. If you are working in Swift, you can use Support.com Cloud SDK with the mix and match feature. 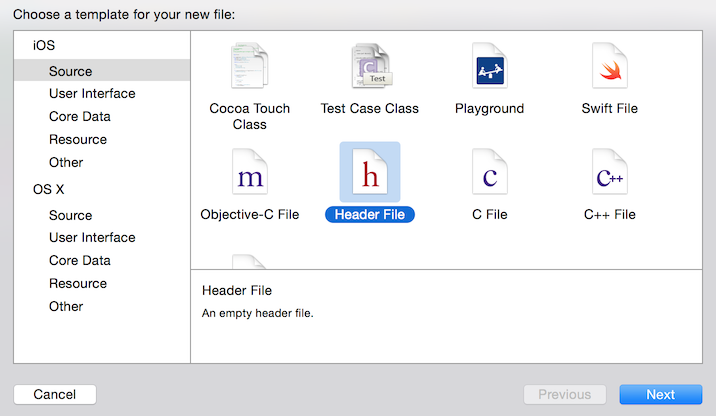 Mix and match works by using an Objective-C bridging header to expose the required Objective-C files to your Swift code. You can skip this step if you already have an Objective-C bridging header set up in your project. This will be your Objective-C bridging header so you can name it something appropriate like SupportComCloud-Bridging-Header.h. Next, in your project’s Build Settings look for Objective-C Bridging Header under Swift Compiler - Code Generation. Complete API documentation can be found at API Doc. You should invoke initialize API from within didFinishLaunching. This API accepts one argument, an application token, which is used to authenticate and authorize your application with Support.com Cloud server. You will need to generate this token at nexus.support.com. In your AppDelegate, create a shared instance of SupportcomCloudSDK using the following. // Error handling to disable/hide getHelp button. You can invoke two versions of LiveHelp via the SDC iOS SDK. This scenario is for those use-cases where the CX has already received a connection code from the agent. They could already be on a call with the agent or they may have received an SMS containing the connection code. connectToAgent API should be used for such scenarios. This API will bring up a connection screen that will allow the CX to insert/paste the connection code received from the agent. In this case, CX is trying to escalate their issue to an agent. Invoke showLiveHelp API to support such use-cases. Invoking this API will bring up a screen containing chat/call options based on your live help configuration (support phone number and/or skill). a) Call: By configuring your call-center phone number in plist, you can provide call option to your customers. Call option will display your pre-configured call-center phone number. Your customer can then call your help phone number, to talk to your support agent. b) Chat: By configuring skill in plist, you can provide chat option to your customers so that they can instantly chat with your support agent. Skill is used to route the session automatically to the available & most relevant agent. If neither of the values are configured, API will return an error. Your technical agents can then use all features of the Support.com Cloud SDK: chat with the customer, co-browse your app, push URLs, execute supported commands and use SupportCam™. To end Live Help following API must be called. Using Self Help APIs you can embed Self Help directly in your application and surface relevant guided paths. Self help topics can be queried by help id or an array of tags. @param Id: Help Id of guided path(s). @param Tags: Tag(s) of guided path(s). @param displayOrder : Array of display order strings. Order in which self support page should load (For ex. search, categories, paths, etc). If this array is empty then the display order is @"paths"
@param viewController : Pass your viewcontroller inherited from SDCWebViewController if you want to display self service content in your view, if you pass nil then self support UI from SDK will be used. You can also start self help without passing help id or tag(s). But this will load all the available guilded paths from server. These APIs should be invoked whenever you would like to set information about a user. Identity: A user’s identity context generates a corresponding consumer within Support.com Cloud. All calls accept a single string argument. (SupportcomCloudSDK.sharedInstance() as AnyObject).firstName = "Consumer's FirstName here!!" (SupportcomCloudSDK.sharedInstance() as AnyObject).lastName = "Consumer's LastName here!!" (SupportcomCloudSDK.sharedInstance() as AnyObject).email = "Consumer's Email here!!" (SupportcomCloudSDK.sharedInstance() as AnyObject).externalID = "Consumer's ExternalID here!!" (SupportcomCloudSDK.sharedInstance() as AnyObject).phoneNumber = "Consumer's Phone Number here!!" If you want to preserve this context data between each session, call SupportcomCloudSDK.preserveContext(true)., before the self help and assisted service api calls. Logging / data: The context APIs also provide support for logging actions, device information, or content information about a user. Each call accepts a string for a key name and an optional object or primitive for the data value. You can also clear a user’s context, or their identity information, specifically. Add “NSPhotoLibraryUsageDescription” and “NSCameraUsageDescription” to the Info.plist. Warning! Failing this iOS 10 will exit the app by crashing when user tries to access the controls of camera or photo library. Support.com Cloud SDK can be customized, to match the look and feel of your iOS application. All of the UI customization can be specified under SupportcomCloudResources.bundle/SupportcomCloudBranding.plist. This area deals with common styling across all SDK Screens such as fonts, colors, backgrounds etc. You can set attributes such as navigation bar title, font, color, title color etc. i) Back Button : Support.com iOS SDK displays a Back button on the Help Screens to allow a consumer to get back to the 3rd party app screen during the course of a self help or live help session. When consumer taps on back button, their help session is still in progress and can be accessed from any of your screens by tapping on the chat head displayed in the status bar. You can control whether the chat head will be displayed or not. You can also specify a different icon for the chat head. If you would like to provide a custom implementation, you can do so by registering for isLiveHelpActive. ii) Done button: It is displayed to allow consumer to close the help session and return to the 3rd party app screen. You can also specify a button image for the same. When image is specified, the name will not be displayed. If neither are specified, the button will be hidden. a) phone: This is your help / call-center phone number. If no phone is specified, live help mode will not display call option. b) skill: If your customer chooses the chat option in the live help screen, you must specify the skill to which the session should be routed. Based on the skill, the session will be assigned to the available and relevant support agent. If no skill is passed, live help will not display chat option. One of phone/skill must be configured to use Live Help. a) You can specify fonts that will be used across all screens as well as on alerts. b) Notifications related settings allow you to control whether or not the Support.com Cloud SDK notification count should be displayed on your application. c) Other settings you can control as part of the Generic configuration includes T&C and Privacy URL to get consumer consent during the course of a live help escalation. 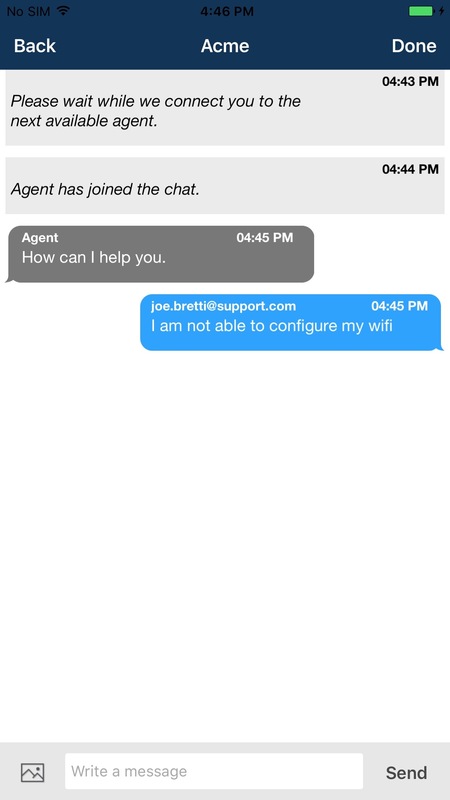 Live Help settings allow you to customize look and feel of chat and/or call buttons. b) Call button: You can control call button title & call button icon image. c) Chat button: You can control chat button title & chat button icon image. d) Button Attributes: You can control button border color, button background color & button text color. Chat screen displays 3 types of messages: messages sent by agent, messages sent by consumer and system messages. You can control time text color, bubble background image, message text color, sender text color. You can control the background color, time text color and message text color. Chat screen has a message composer. You can configure its background color. You can also configure the title/color for the send button. a) Title & Message: You can control alert description color and alert title color. b) Allow button: You can control allow button color, allow title and allow title color. c) Cancel button: You can control cancel button color, cancel title and cancel title color. In order to register your Xcode project for Universal Links, you need to create an App ID in the Apple developer portal and enable the proper entitlements. This is very similar to the configuration required for in-app purchases. a) Enable ‘Associated Domains’ in your app identifier on developers.apple.com: For your pre-existing or work-in-progress App Identifier, scroll down and check the ‘Associated Domains’ services. Scroll down and click ‘Save’. b) Enable ‘Associated Domains’ in your Xcode project: Now, you’ll want to enable the ‘Associated Domains’ entitlement within your Xcode project. First, make sure that your Xcode project has the same Team selected as where you just registered your App Identifier. Then go to the Capabilities tab of your project file. Scroll down and enable ‘Associated Domains’ so that the accordion expands. c) Add the domain entitlement In the domains section, add the appropriate domain tag. You must prefix it with “applinks:”. In this case, you can see we added “applinks:nexus.support.com”. d) Refer below section to register your application ID and application prefix with Support.com Cloud. Once your application is tested, reviewed by Apple and available on iTunes, please register the application URL with Support.com Cloud. 3.Click on Third Party Apps in the drop-down. 4.Click on iOS tab and turn ON the Status slider. 5.Now provide the application details: Name, iTunes URL and Connection Guide URL. 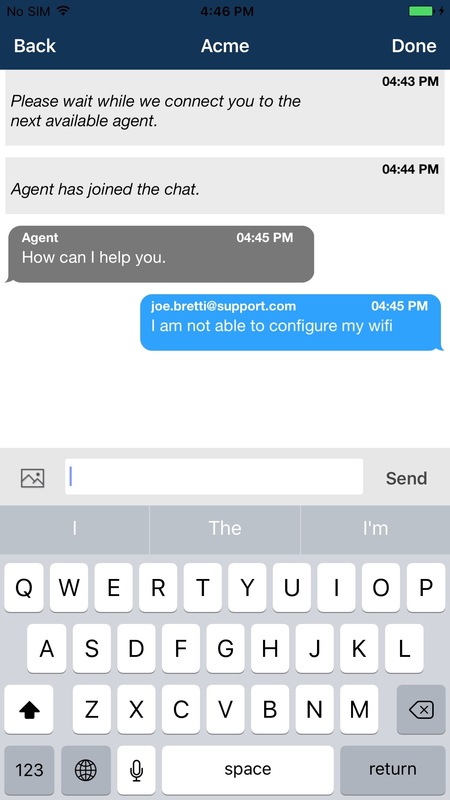 NOTE: If you do not enable the above, the default Support.com Connect iOS App will be available. 6.Enable “Tab to connect” option only if your App supports Auto Connect Link, and enter your application prefix & Application ID. How much size will the iOS SDK add to my ipa? iOS SDC Connect SDK will add about 11 MB to your ipa and 24 MB to the footprint of your app. You may have observed that the iOS SDK zip file is about 48 MB in size and post decompression it is about 150 MB. This is so because the SDC Connect SDK includes various additional items that add to the size of the zip, but are eventually not shipped as part of your application. For example, we include i386 etc architectures to enable debugging via simulator. This architecture is not needed when the app runs on iphone/ipad device and is stripped out. Because of this the actual addition to the size of your ipa is much less at about 11 MB.